For almost two years I have been testing, re-testing, and re-wiring my setup on Grace in an effort to find the best LTE antenna configuration. I don’t remember another project I worked on that took so much time and effort to gather data. We use the Internet all of the time while on board, and I want it to be reliable, fast, and easy to use no matter where we are. 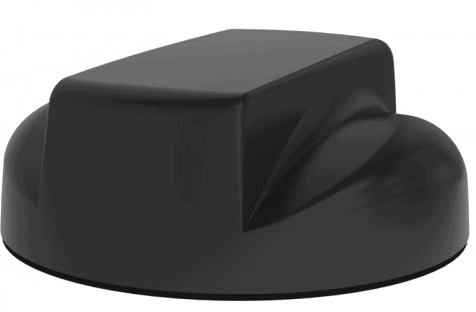 The search for a good antenna system led to some surprising choices. In poor signal areas, improve the signal to allow for basic network operations – WiFi cell phone calling, sending emails, etc. Crew expect internet speeds on the boat to be the same as home. In reality, this is unlikely because LTE/cellular is still a bit behind the broadband internet market. However, to a crew member, a wireless network looks the same on a boat as at home. Even explaining it to them doesn’t mean they change their habits. So I need a fast network when we’re near civilization. Marina WiFi is hard – I even wrote a whole article about it – and most of the marinas we visit are no exception. While we can get a WiFi signal from them, I find that in the majority of cases, it is actually better to use a cellular connection as it is more reliable and consistent. Again, having a fast network here will help out. When we are far away from normal signals, being able to amplify what signal is available is important for safety and planning. I use a bunch of internet based tools to plan voyages and look at weather, and having access to those helps the quality and safety of the trip. Also, being able to place a phone call in the event of an emergency is also very helpful, although not required. And of course, my boat network is significant, and I would like to have it connected via a quality connection all the time. SignalK, AIS dispatcher, Victron, FloatHub and many other devices transmit data from the boat out to various cloud and private services. In addition, with my redundant internet configuration, I wanted to ensure it was always connected not only for outbound data, but when I VPN in from remote locations to check on things. 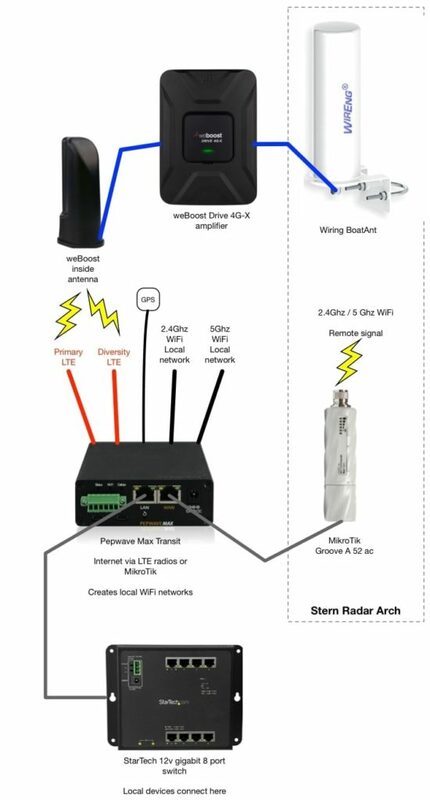 What I am attempting to test and improve is the two red items in the diagram above – the LTE internet connectivity and antennas. 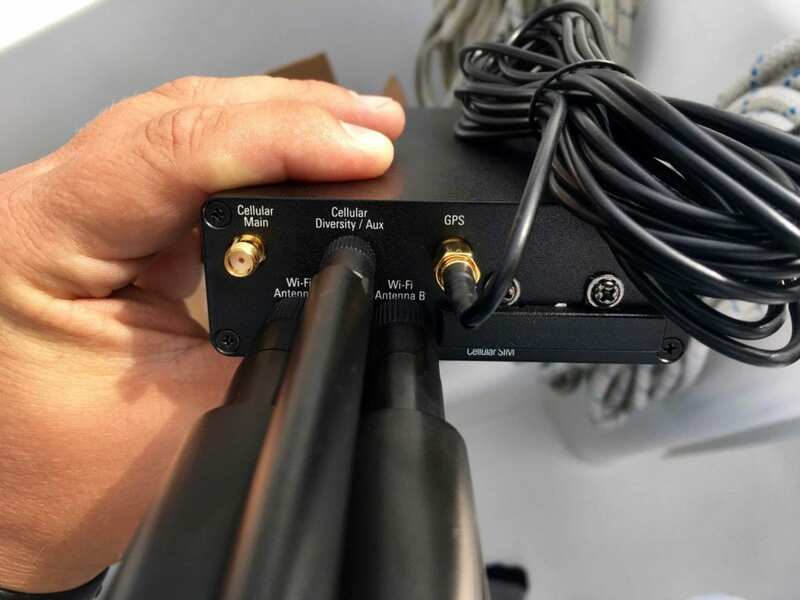 The Peplink has two stock cellular antennas that connect directly to the connectors and extend about 6 inches, a primary and one for diversity. 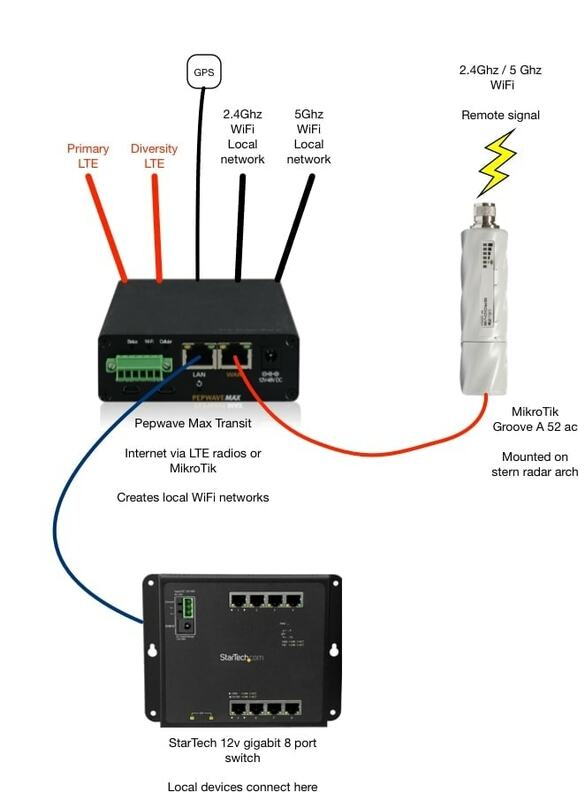 The Peplink has one WAN port connected to the MikroTik which can be used to grab remote WiFi signals. The MikroTik is mounted high up outside on the stern radar pole, while the Peplink is mounted inside in the Internet Alcove. The LAN port of the Peplink is connected to the StarTech switch where all other cabled devices connect. The Peplink has two SIM card slots, and I have both an AT&T and T-Mobile SIM active and under test. 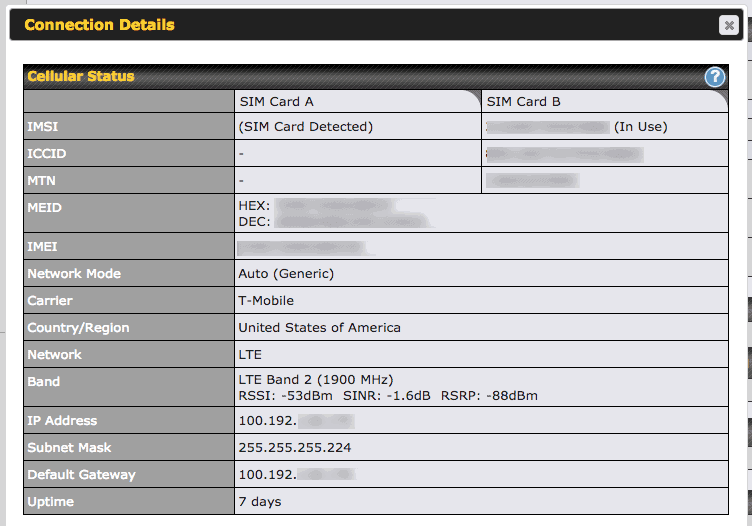 I also did some testing for a few weeks with a Verizon SIM card. The goal was to see if connecting things directly to the antenna ports on the Peplink, or using the stock antennas along with a booster, would give the best result. There are hundreds of antennas on the market, so choosing a starting point is sometimes overwhelming. Besides the antennas below, I have had over 20 other types on the boat in the last 5 years which I’ve used in various settings. I chose the ones below because they met all of my requirements, and came more highly recommended. Every time I performed testing, I attempted to gather as much data as possible about the environment, and test multiple antennas or configurations to rule out any problems with cabling, gear, and the like. All of this data was recorded in a big massive Google Sheets spreadsheet and analyzed later. Elliott Bay to Friday Harbor to Roche Harbor, with stops in various places along the way (Port Townsend, etc.) and in the San Juan Islands – two separate trips in summer of 2017. South Puget Sound trip in 2016 with stops in Tacoma, Olympia, Eagle Island, Longbranch, Jerrell Cove, and many other places. Besides the test runs outlined above, we used all of the antennas and configurations in various combinations for real-world use over the last year. This included trips all around Puget Sound and the San Juan Islands, as well as at home or familiar marinas for longer periods of time. In all cases, there was a mix of real-world traffic from cell phones, laptops, tablets, Grace’s huge network, and the on board Roku. This probably won’t surprise you, but an external antenna mounted high on the boat provided the best overall result. The higher the better, and away from other items that cause interference. The best antennas were the largest – physically – of the bunch. I was surprised at the crappy cable included with some of the antennas. Having a single run with no extenders, converters or the like is critical to realizing the gains from your antenna. Bad cabling can essentially cancel out or actually contribute to a negative signal compared to no antenna! The best cable included in my testing was from WirEng. I had both an in-line and standard booster, sometimes called an amplifier, and in both cases it improved the overall signal. The in-line booster provided less of a benefit, and I wouldn’t really recommend them because of the power draw compared to the gains. Standard boosters that have a second antenna that “rebroadcasts” the signal worked extremely well. I tested both the Panorama and the SinglePoint antennas, and saw very little benefit in either configuration. Initially I was attracted to the idea of a single antenna pre-cabled for multiple connections, simplifying the install. In reality, it made for a heck of a lot of cables all getting caught up, and poor antenna performance overall. 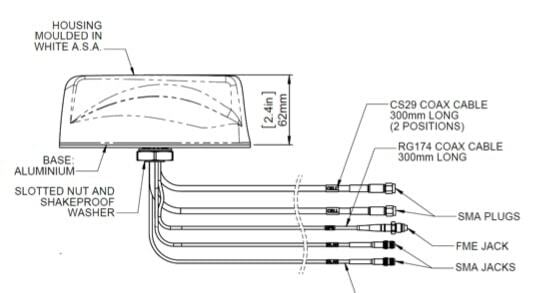 It’s better to spend money on two larger LTE antennas than one single antenna if you absolutely need it, which I don’t think most people would. The multi-element antennas had dual LTE antennas, a GPS antenna and some combo of WiFi antennas, and are generally used on vehicles. They also often require a ground plane, which is hard to do on a boat. 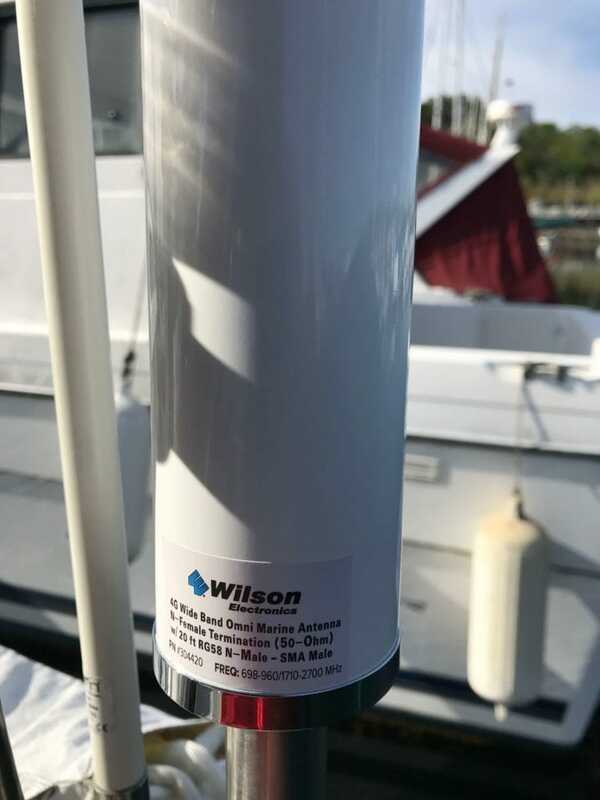 The Wilson Electronics 4G Wide Band Omni Marine Antenna was the most marine-ized and came with good cable and mounting options, including a standard marine sized stainless steel pole. The BoatAnt antenna did slightly better in signal coverage areas, but it is not marinized and has some other drawbacks. This Wilson antenna did extremely well, and is my first choice for a good antenna. This was one of two multi-element antennas I tested, both primarily made for vehicles. I was attracted to the Panorama after having read about the company antenna history, and was intrigued with having a single antenna with elements for 2x LTE antennas, 2x WiFi (5/2Ghz), and GPS. The antenna itself is round in shape with a fin box through the middle, about the size of a small saucer plate. The cabling looked to be good quality, although slightly thinner than I would like, and was around 16′ long, which was a good length to get it connected to the Peplink directly. This antenna had an individual connector for each antenna, so they could be directly connected to the Peplink’s ports and replace the stock antennas. The bigger challenge was managing 5 different cables, all 16′ long, which became a rats nest of crazy cabling while trying to run things. I ended up zip tying everything together, but it was still a bit of a bear to manage. Unfortunately the gains I saw from the antenna did not exceed using the stock antennas on the Peplink, or at least not much of the time. Even after adding a ground plane and doing other tweaks, I just didn’t see enough of a signal increase to warrant the expense and cables. I suspect this may have been affected by the lower quality of the cable. I did see some increases in overall throughput due to the fact that both primary and diversity antennas were given dedicated elements in the antenna. However, those gains were only where good signal existed to begin with. Overall, I would not recommend it. I found out about the SinglePoint roof mount antenna from friends on Safe Harbour and Airship of Slowboat.com. 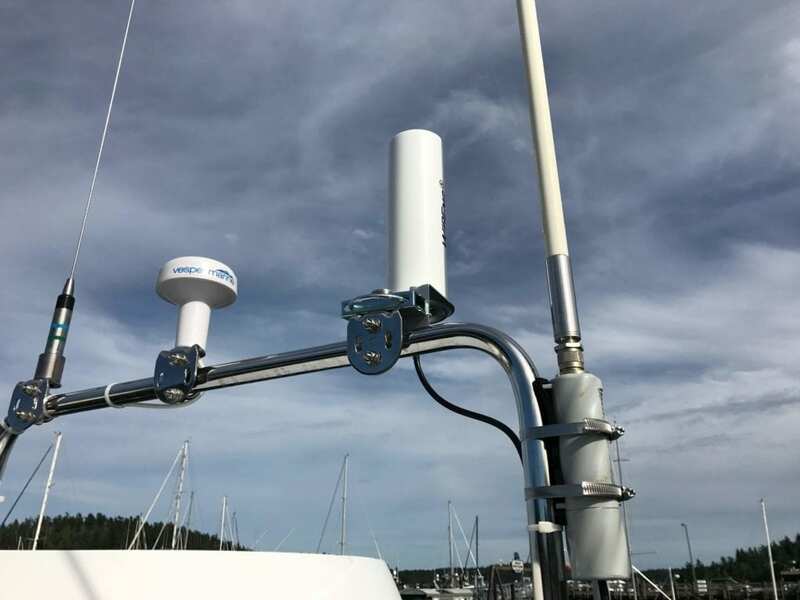 They used various configs of this antenna on their epic Flotilla to Alaska in 2017. It is similar to the Panorama in that it has cabling and elements for 2x LTE antennas, 1x WiFi, and GPS. I was a bit disappointed that it didn’t have 2x WiFi which would have made it a direct comparison to the Panorama, but I was trying to set things up for LTE anyhow, not WiFi. The cabling looked less shielded than the Panorama, and was quite short – only about 10′ which was very limiting. Adding extenders would almost negate the benefits from the antennas gain. I ended up having to do this for some testing because my Peplink unit was about 15′ away. As above with the Panorama, the gains I saw from the antenna did not exceed using the stock antennas on the Peplink. The only benefit I saw was increased download/upload speeds sometimes – this was almost assuredly because of the diversity antenna configuration. To make matters worse, the SinglePoint had shorter cable with lower quality which meant either relocating everything, or extending it and actually seeing a negative gain compared to the stock antennas! I’ve had this antenna for almost a year and a half, having purchased it as part of my initial internet setup on Grace. It was not meant for marine environments, and it has not weathered well. It has given decent performance in the last year and a half, but was one of the main reasons I started searching for a better antenna. In areas where the signal is lower, the SureCall simply didn’t perform. 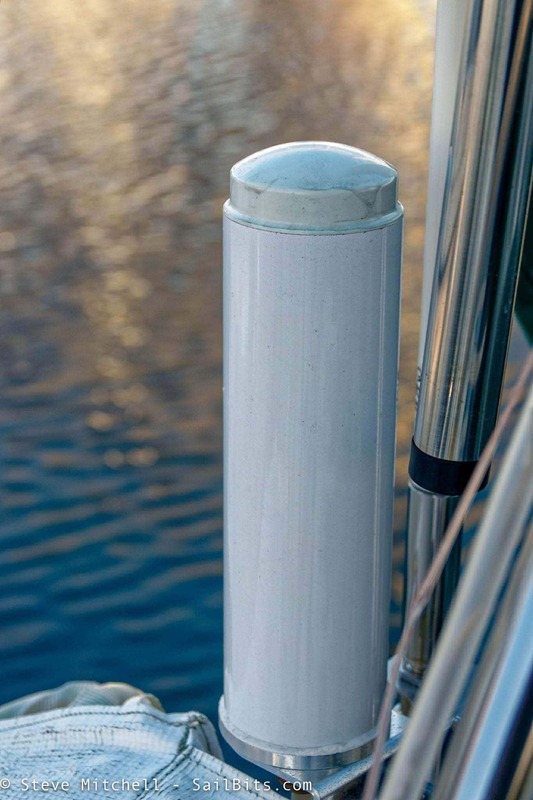 The mounting hardware is not marine grade at all, so beware – mine started corroding within months. I found out about the WirEng BoatAnt while chatting with Chris Dunphy over at the Mobile Internet Resource Center. Most of their site is focused on RV’ers, but they have gotten into boating in the last couple of years as well. 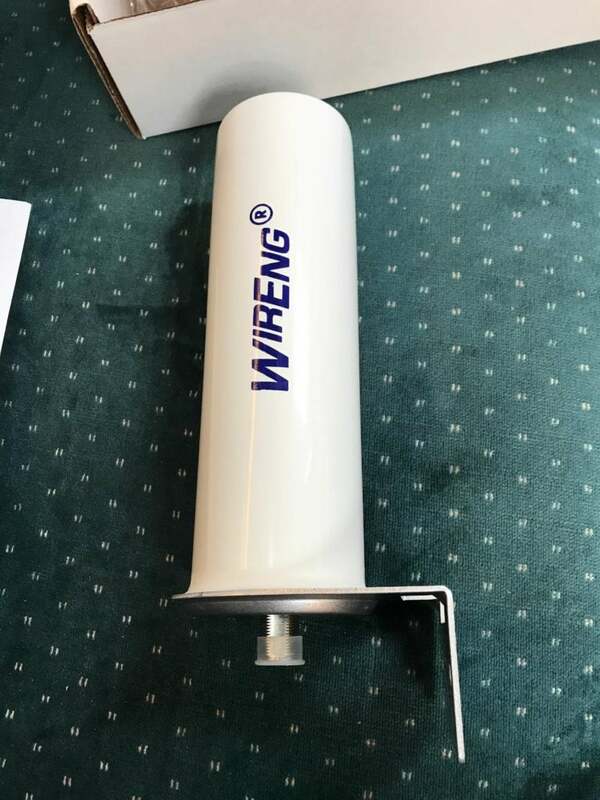 They had used WirEng products on their RV and found it very good quality. It is the largest of all of the antennas, beating out the Wilson by almost an inch. It is also very hefty and feels well made. The cabling that came with it is absolutely fantastic – the thickest provided, and with quality ends provided by WirEng. In all of my tests, this antenna outperformed every other one I used. The specs claim a whopping 10dBi gain which is double several of the other antennas, and at least 3dBi more than the best specs. Strangely I don’t see the ability to buy direct from WirEng anymore – only a contact form to fill out for details. It does appear you can get them on Amazon, but check the seller and make sure it is WirEng. I would highly recommend this antenna. I no longer recommend any BoatAnt products due to massive quality issues, lack of response from the company, and jacked up prices (2-3x!) for all of their products. I have had the Wilson in-line booster amp for a couple of years, and looking at the newest version online, it hasn’t changed much from what I can tell. It cites a 15db gain, which I saw consistently when it was connected. In terms of overall upload/download performance, it didn’t seem to improve things unless we were in a place with terrible signal coverage. In almost all cases, two external antennas gave a better result even in low signal areas. The bigger issue is that it only has one output port, so only one of the two LTE connectors on the Peplink could be connected. This meant that the secondary diversity antenna would be un-amplified, and using the stock antenna inside the boat. Wilson also owns the weBoost product lines, and they came out with the weBoost Drive 4G-X booster which included the amplifier, external antenna, internal antenna, and cabling for all components. I didn’t care for their provided antenna, and while I did test it, it didn’t really impress me. What I did like was the amplifier and internal antenna. This booster ended up providing the best overall performance no matter where we were. The internal antenna is mounted only a few inches away from the stock Peplink antennas, and the outdoor antenna was a mix of all of the above antennas. With the boosters internal antenna near the Peplink, that meant that both the primary and diversity antennas on the Peplink could use the boosted signal, which resulted in not only better signal strength, but faster download speeds. I would recommend this booster. 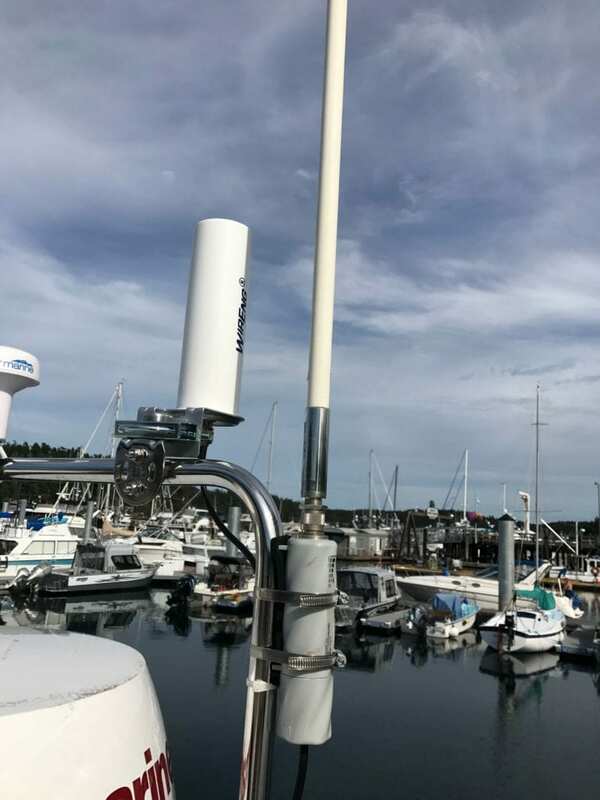 This gave the best signal in hard-to-reach areas, increased overall bandwidth in decent coverage areas, and has performed well in marine conditions. I originally started out hoping to only have an external antenna, directly connected to the Peplink – no booster or amplifier. But I found in places with very poor signal, an external antenna alone was not enough. A booster adds more power usage and complexity, but as important as the Internet is for the crew and all of my network, I would rather have a quality signal everywhere at the cost of more power usage. I also have a coupler taped near the amplifier, where the outside antenna meets the inside antenna cable. Worst case scenario, I can join the two together, bypassing the amplifier, and remove the inside antenna and connect the cable directly to the Peplink. Or, worst case scenario, simply turn off the amplifier and use the stock antennas on the Peplink without any external antenna. I have been using this configuration now for 6+ months and have been very happy with both the coverage in bad signal areas, and overall performance when in better areas. 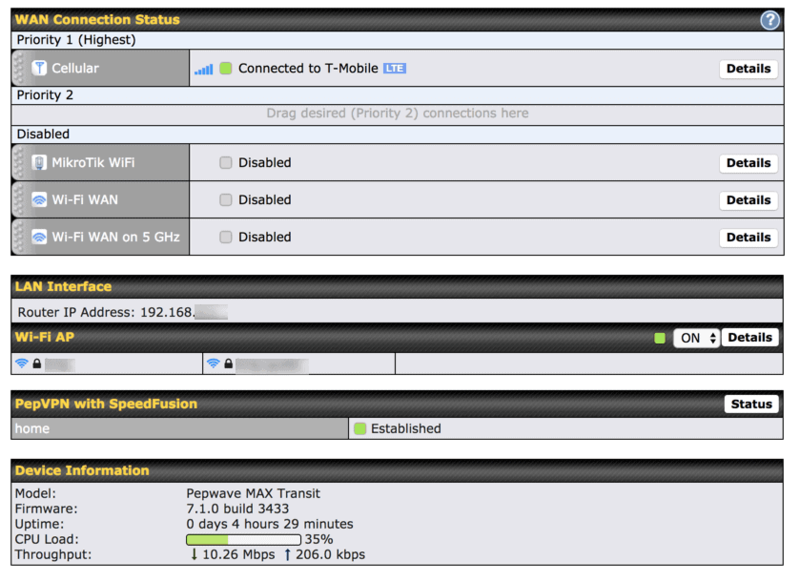 At my home marina, I regularly get about a 25ms ping time, 20-40Mbps download, and 10-20Mbps upload on T-Mobile. That’s pretty good for an LTE connection. AT&T shows a 25-35ms ping time, 20Mbps download and 20Mbps upload. Crossing the Strait of Juan de Fuca towards the San Juan Islands, we usually lose signal somewhere around Smith Island, and gain it back a while later. With this configuration, we had signal almost all the way across, albeit very slow 3G for a time. This is exactly the outcome I had been hoping for – something that is super fast and able to handle multiple streaming devices when near civilization, and coverage when in the boonies enough to do the basics. It is important to note that you don’t need all of these to improve your connection. 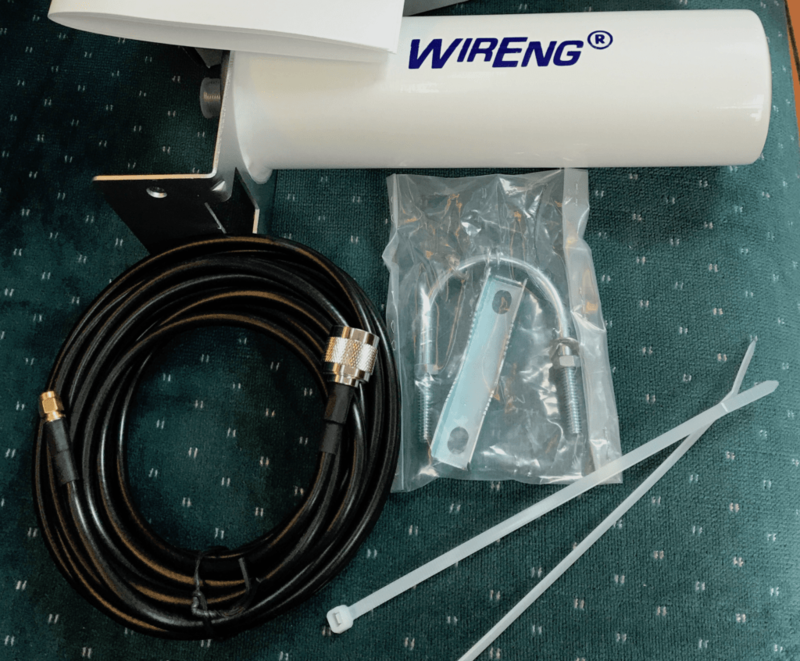 If you don’t have a Peplink device, you can still add the outdoor Wilson antenna and weBoost amplifier and gain considerable coverage and improve your throughput. Whatever you’re using now, if it has an LTE radio in it, it will need to be close to the indoor antenna. Many people also simply use the indoor antenna with their cell phones, although you do need to be relatively close for this to work reliably.